When you think of Black Friday, isn't plant-based holistic shampoo the first thing that comes to mind? If so, you're going to absolutely love shopping at Aveda! On Black Friday they typically offer a great selection of free samples plus free shipping on all orders when you enter a special holiday promo code. While we don't have the code for 2019 yet, we expect to have it shortly before Thanksgiving so be sure to keep an eye on this page. The 2019 Aveda Black Friday deals have not yet been released. While we don't have the Black Friday ad for Aveda.com yet, below are some of their historical deals which will give you a good indication of what you can expect during this year's sale. 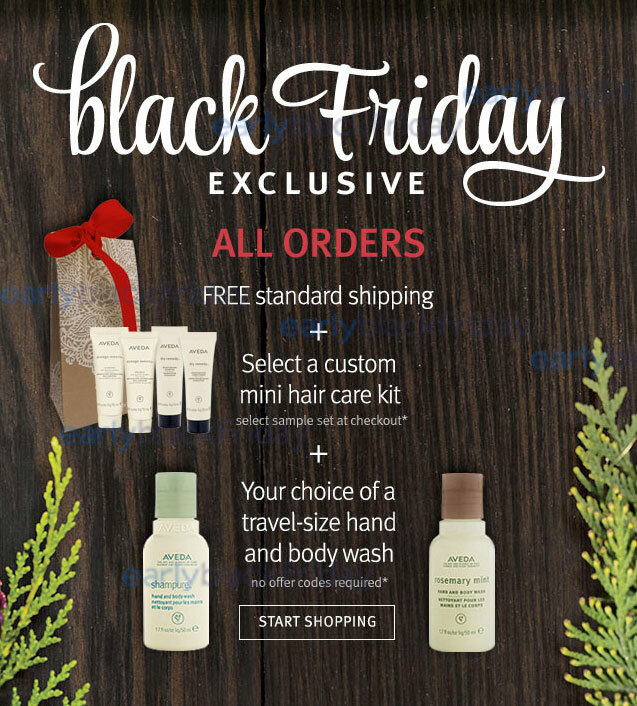 As a Black Friday exclusive, all orders at Aveda.com will receive free standard shipping and you can select a custom mini hair care kit plus you get to choose a travel-size hand and body wash too! Getting samples and free shipping is what a typical Aveda Black Friday brings and it has proven to be one of their most popular offers that are available each year. Since the best samples tend to become unavailable pretty quickly, we suggest you shop at Aveda.com now while the best samples are still in stock. 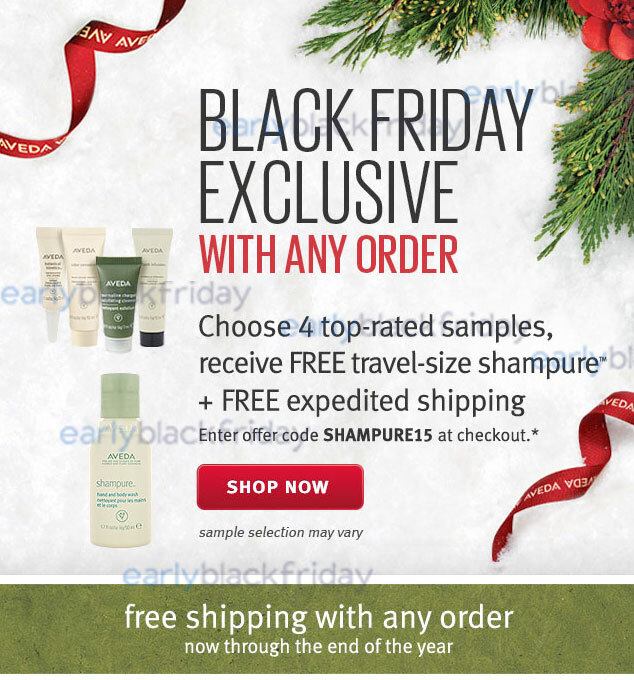 In 2015 the Aveda Black Friday sale included four top-rated samples and you received a free travel-size shampure plus got free expedited shipping on all orders. To get this deal, you need to enter offer code SHAMPURE15 at checkout. Unlike last year, the sample selection this year varies with each other so you don't have the flexibility to pick the best samples this year as it's more like a grab bag of whatever they decide to throw in. Either way, Aveda's products are all excellent quality so we definitely suggest checking out their sale this year. 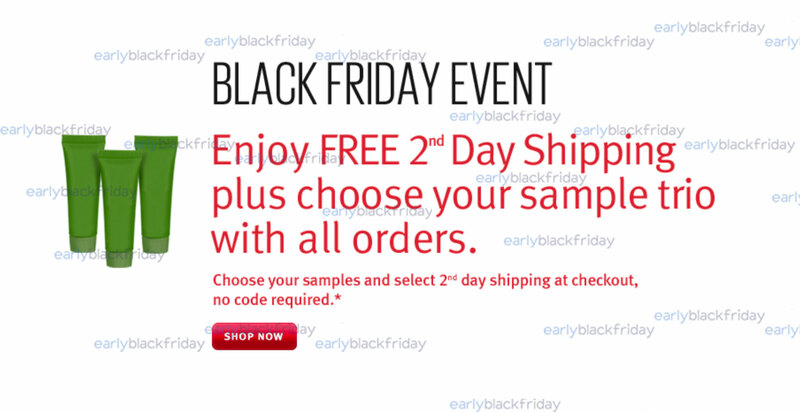 Aveda's Black Friday event in 2014 included free second day shipping plus your choice of a free sample trio with every order! No code is necessary to take advantage of the offer and you go to pick which samples you received which was kind of cool. While their Black Friday sale this year is somewhat lacking compared to other retailers, it's nice that you can try out a variety of their plant-based holistic cosmetic, skin and hair care items as free samples, and get them shipped for free, when you buy anything else on their site during Black Friday.